Home Costs > How Much Does a Pier and Beam Foundation Cost? How Much Does a Pier and Beam Foundation Cost? Before the 1960s, a home used to sit in the air, simply elevated by pier and beam structures. Today, however, while the pier and beam foundations exist, they are not so popular as a foundation choice but can commonly be found in an area prone to a lot of rain or flooding. This type of foundation are basically elevated wooden foundations which will rest on concrete piers positioned about two feet off the ground. Most of the modern homes you see today will usually have a concrete barrier beam which will run around the perimeter of the home, with most providing a crawlspace beneath. When designing a home, homeowners often opt for this type of foundation as it can have many advantages of the average slab foundation. 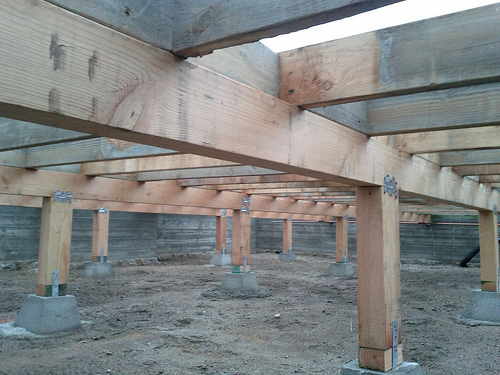 The costs of a pier and beam foundation can greatly depend on the number of piers your home needs, the condition of the home, the site’s condition, your geographical location and the contractor you decide to hire. Most of the contractors who wrote on the subject online noted it is really hard to offer an estimate online as an inspection is always needed before the foundation is even considered. However, from those who did share their costs, the quotes seemed to average about $7 to $11 per square foot. This estimate would include the excavataion, soil testing, footings, the foundation, beams, joists, anchor straps, insulation and the subflooring. Again, there are MANY factors and it’s very hard to offer an estimate, so use this as a starting point only as your results will vary. Since all jobs will be so unique, we highly recommend you check out HomeAdvisor.com. Here, you can explain your job and contractors will email you ballpark estimates or more information for free. RaisedFloorLivingPro.com broke down the cost comparison between a raised floor versus a slab. In their detailed break down, the final costs for a 1,920 square foot home would be about $14,074 when the excavation, soil treatment, footings, foundation, beams, band joists, joists, anchor straps, the porch, insulation and the subfloor. A forum member on this DIYChatRoom.com forum thread stated he said quotes were in the $600 to $1,000 per pier range, while another said it is impossible to price as there are so many factors involved. What is a pier and beam foundation? Piers, often referred to as footings or poles, are the columns which form a base in order to hold up a structure; in this case, it’s your home more than likely. For an example, you often see them beneath either a deck or a beach home. These footings are dug into the ground to the depth below the frost level, usually placed about eight to 12 feet apart, all depending on the size and the weight of the structure. Generally, the more weight the foundation needs to support, the more piers you will need. Spanning beams then connect these piers together to transfer all of the weight to the ground. For this type of foundation, the soil needs to be inspected to ensure it’s able to withstand these concrete footings to prevent excessive contraction, expansion or any sort of shifting. Soil, which contains more gravel, may hold more than weight than the soil, for example, making it a poor candiate for this type of foundation. As mentioned, a pier and beam foundation can elevate a home, preventing it from flood and any excessive moisture. Since the home is elevated in the air, space is created between the home and ground, known as a crawl space. This space can come in handy if you need to work on any plumbing, electrical or need to address any other issues beneath the home as everything will be readily accessible. PermaPier.com claims this is the biggest advantage over a slab foundation as you will not need to drill through the concrete if a plumbing issue were to occur, for example. This, in turn, would lead to a cheaper-than-average repair bill. Beneath the home, the wood platform, instead of concrete, adds an extra layer of insulation, often providing lower utility bills. Since this type of foundation has individual piers and beams, it is easier for a contractor to find foundation problems in the future. The biggest disadvantage, from what we researched, seems to be the costs. Elevating your home, regardless of how it’s done, will always be more than allowing it to sit directly on the ground. In the future, when selling a home, a few obstacles may arise, including sagging floors, moisture problems, poor ventilation, rotting wood and/or pests/rodents in the crawlspace area. Termites, pests and rodents can be a problem as well since many prefer the shelter of your home to build their nests. Moisture can enter the crawlspace, and if left ignored, it can cause an unpleasant odor, creaky floors, mold and/or even wood rot.